Called Renato since I had heating issues with my furnace and he responded immediately. I was even more impressed that he showed up later that day to check it out. He really is the best and knows his products. in a couple of minutes my system was up and running! My HRV that he installed few years ago started some ice buildup on one of the big pipes (even if it is insulated) and he advised to run it for 20-30 minutes every week to exchange the air. And that solved the problem! Don't even bother looking somewhere else! Renato is the one to call for all your HVAC jobs! Very honest and professional! He is going to be the BFF of your HVAC system! 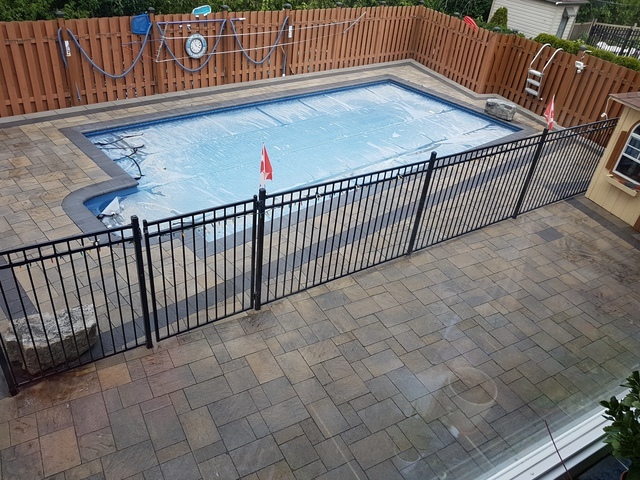 I had same type of interlocking installed on my property 9 years ago and last year during the construction of the pool and extending the patio. So you could see the big difference in color. I wanted to get them cleaned and sealed so I called Danny. From the first moment it was amazing to work with him. 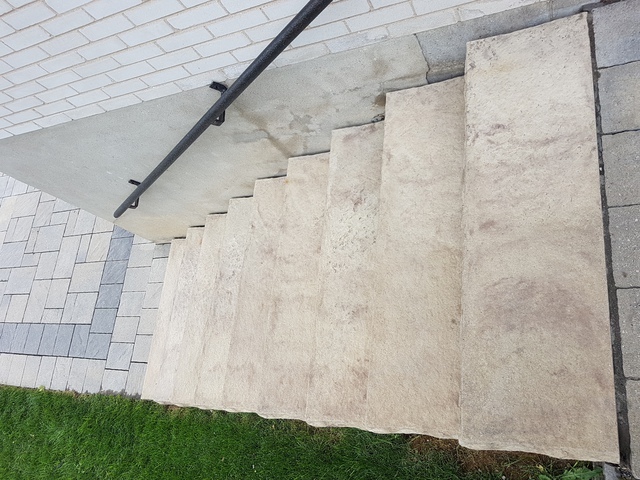 He asked simple questions for the area and provided an estimate for cleaning and sealing. 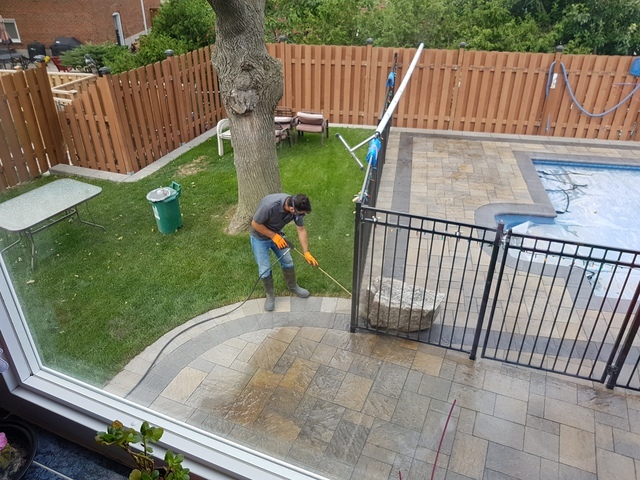 Couple of days later he showed up as promised, cleaned and power washed the stones and I could see at that time that they all had the same color. As agreed, he removed the loose sand and replaced it next day right before sealing with a gloss (wet look) sealer. The results are amazing! 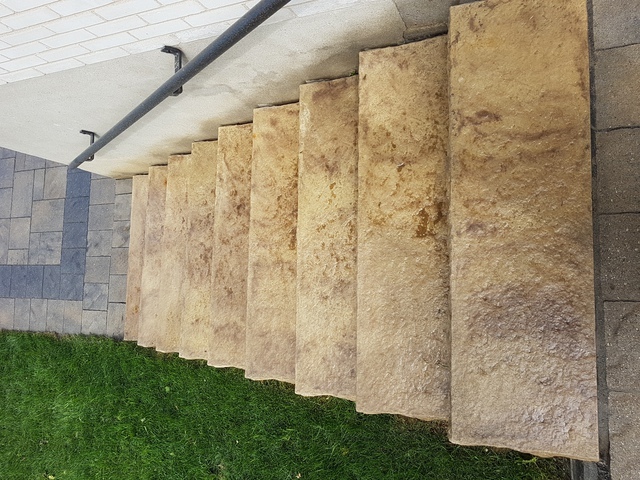 Danny took a very good care when sealing the pool coping stones and I had little (close to none) drips of sealer in the water. I was not expecting that... he was so clean and careful! In short words, Danny was able to do the job right away with excellent results. Great value for your money! your neighbors will envy you! Seal All is fully recommended! You won’t be disappointed and will enjoy the results as much as I do! Please feel free to contact me for more questions! Jorge was very prompt. Came as promised and tried his best to see why my sensors are not working. After a couple of tries, including re-programming the unit, he decided to try a new set of sensors. And this solved the issue! Very professional and courteous. Will call him definitely next time I need help! Fully recommended! Prompt, service as described, payment as agreed. Very friendly and helpful. Thank you for a great review! At Can-Dor we do our best to provide our clients with quality service. I'm happy you were satisfied with the service Jorge provided. Thank you once again and I hope you remember Can-Dor should you have any garage door, window, or entry door needs. Best contractor I've used so far! Renato is very professional and friendly thus making all communications very easy and effective. His team installed a couple of years ago an HRV that work amazing! Last Friday I called Renato cause my air conditioning was not working... Renato came on Tuesday morning and now my family can enjoy the indoor! 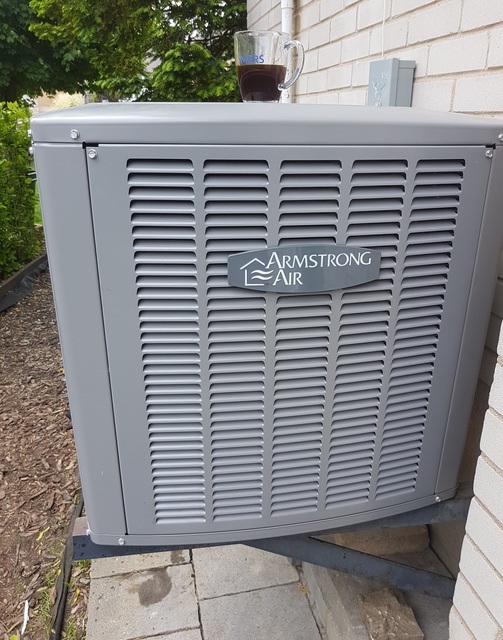 After a couple of discussions and options presented, I chose to install a new Armstrong unit. Renato recommended and I trust him. He always maintains and supports his customers and this is what loyalty means to me. All his jobs are clean, professional, fast and as agreed. Never a negative word to say. Trust on both sides! We behave like friends and that's how all contracting relationships should be! When you work with them you will feel valued and will not regret calling Renato! Look no further! I fully recommend this contractor! Please feel free to contact me directly if more information is required. Thank you again for nice review. We are here to help custumer like you. 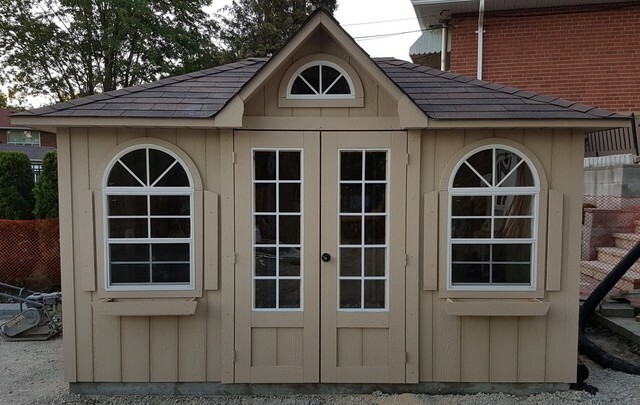 Earlier this year we requested an 8x12 pool house/shed from The Shed Company / Lee Sheds. 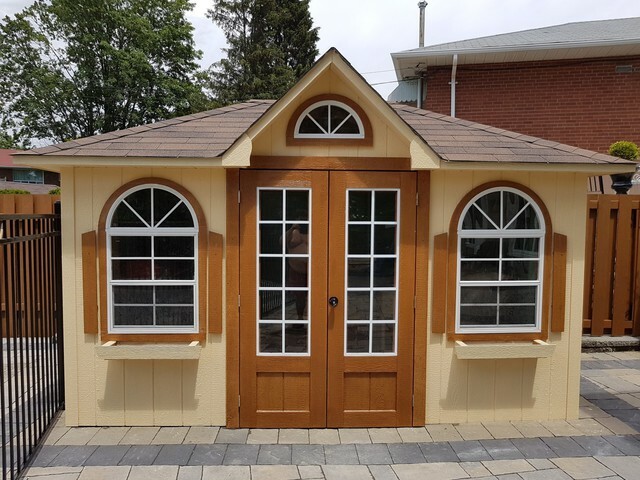 Craig recommended us La Petite Maison (Hip Roof) and we just added the dormer, french doors and large half moon windows to create our own style. We are extremely happy with it. Darren and David built it on site in one day. The shed looks amazing and it is very durable. We chose an excellent paint and the results are amazing including the accent. All the sheds come pre-primed and to get full warranty you need to paint it. Here are some pics before, after installation and after painting. Fully recommended! 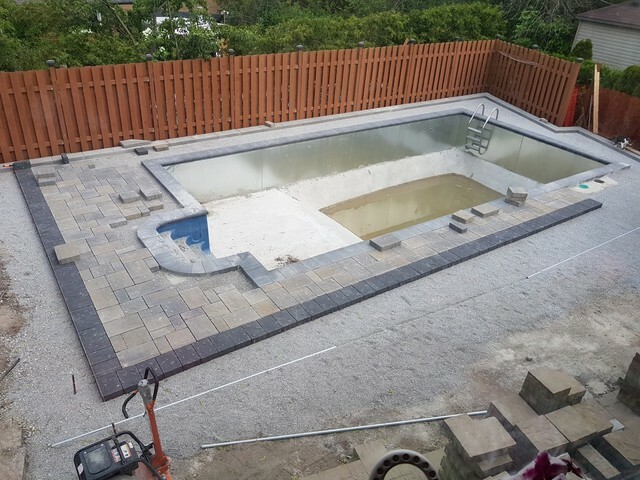 We approached Pool Craft to build an in-ground pool late last year and we agreed to move forward with the project. The approach was the right one: design, build and service it. Rick managed the entire project from the beginning and provided help and guidance every step of the way. He was the go-to person to check the status and make adjustments as we required and needed. Design: we started with a couple of design ideas that were customized to our needs. Julie was very open and provided an accurate final design that was what we were looking for: a great pool and surrounding landscaping. Dig: The dig took only two days. It was a very fast process and they were clean and careful. Our backyard had huge trees so we had lots and lots of roots plus two extremely big stumps left in the ground. They managed to remove them and clean up so the site was left in perfect order for the pool crew to start building on. 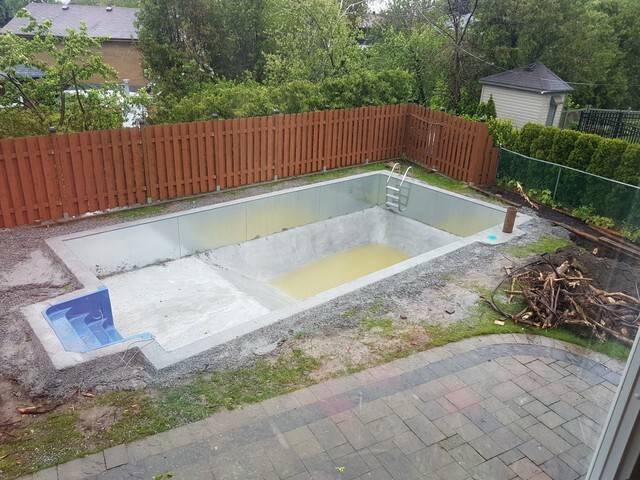 Pool build: Jim and his crew were able to build the entire pool in three days. They did an amazing job. Very friendly, very clean and extremely knowledgeable. I asked many questions and they always had the right answers! They explained the process, they built it exactly and it was all ready for the next step... landscaping! Landscaping: It was done very well, even if the weather didn't cooperate with them. We had to change on the fly some items (additional work requested and needed) and they were able to accommodate these changes without any problems. Kyle's team (Chad, Alex, Brian) were very professional and very knowledgeable. 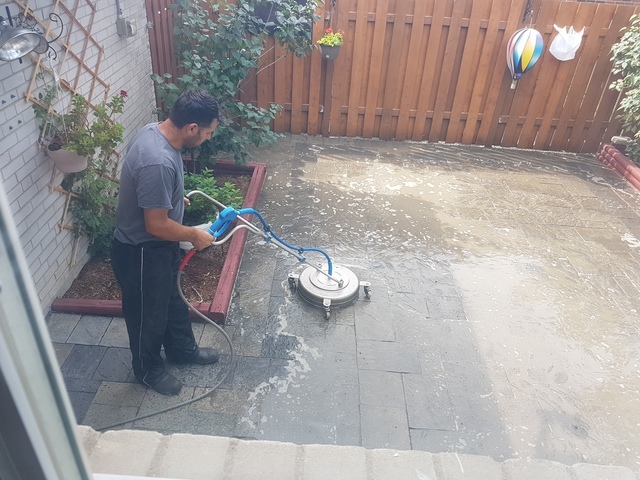 All the tasks were carefully carried out and the site was always clean and neat. 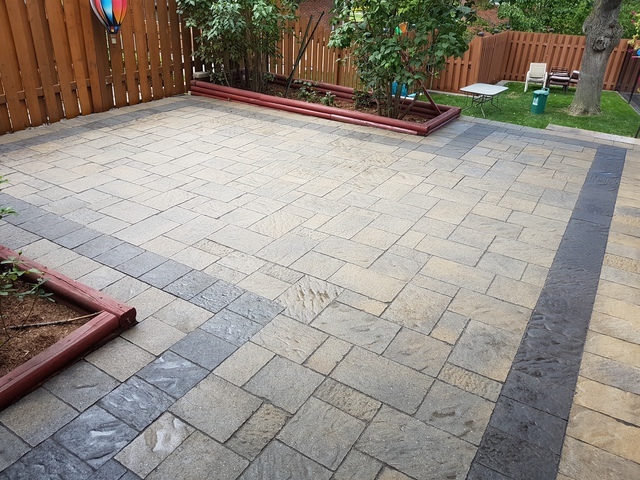 Fences, interlocking, drainage, right sloping, great coping and laying out were just a couple of tasks they were able to deliver in order to create a perfect outdoor living space for us! We selected a shed company based on Rick's recommendation and we are extremely happy with the choice! It was fully built in 1 day and looks amazing! Pool equipment installation, gas and electrical connections were done very carefully. 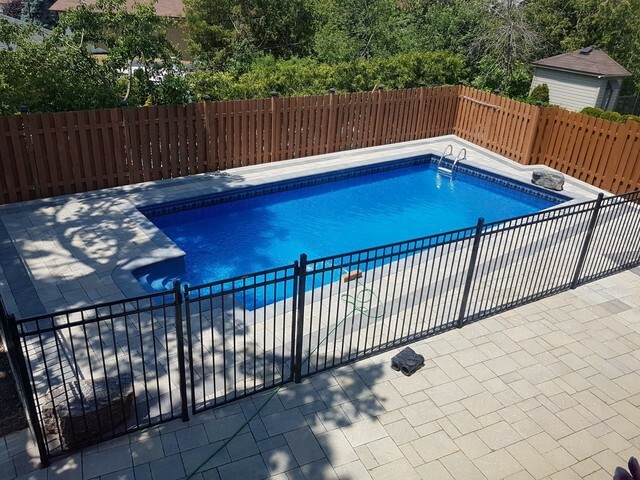 Pool Craft's team did an amazing job and were able to accommodate our space needs. 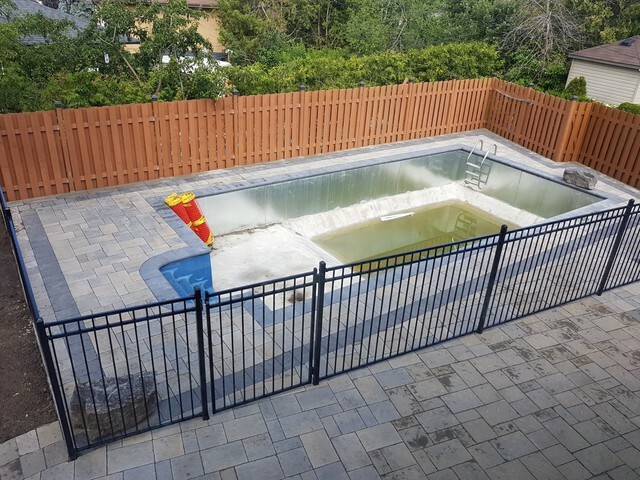 We trusted Pool Craft to install the equipment on one side of the pool house so we can use the remaining for storage of pool toys and other stuff. Next was Scott's liner installation and the fill-up with water. In a couple of hours the pool was ready to be used with Bobby's help and later that day we were able to swim and enjoy it for the first time! Then the pool school. Chris took the time to teach us how to use the equipment, how to maintain the pool, how to benefit from its features, how to adjust what we need, and much more! Pool Craft delivered 100% what they promised. No additional costs, no hassle, no delays. They really did an amazing job and my back yard is now an oasis that we enjoy every day. All of their staff are extremely knowledgeable and a pleasure to deal with. Many, many thanks to Rick, Chris, Jim, Bobby - they all did their part so we can have this dream completed. Fully recommended! 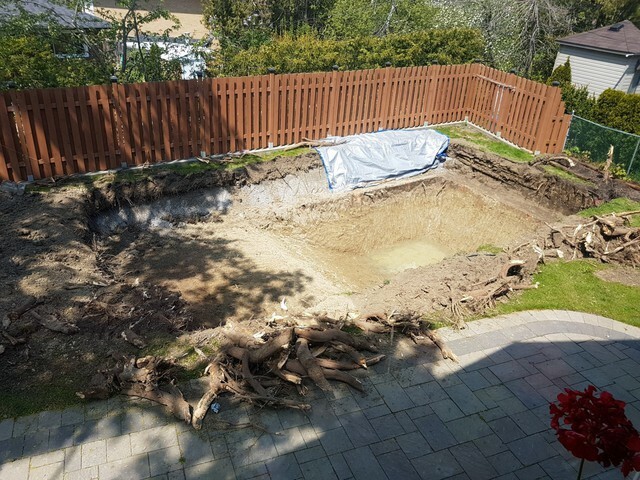 Look no further... you found the right people to build a pool! It will be my pleasure to answer any questions and provide references for them! Thank you, Pool Craft! You did an amazing job! Now we have our own oasis in the backyard! 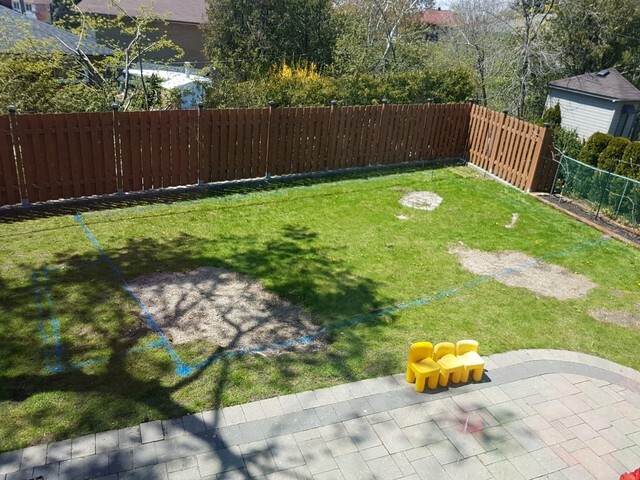 I had 3 huge trees in my backyard and requested a quote from several companies to remove them. Advanced Tree Care gave me the best one and decided to use their services. Very prompt responses. I got a quote for all three trees and the arborist report very fast and accurate. As soon as I got the approval from the city to remove 2 of them they scheduled immediately. They came and in two days the job was done. Very fast, clean and professional. No damage to my property. I truested them so much that I asked for the 3rd tree to be pruned without even quoting that. The work was amazing. Even my neighbors were impressed and gave them kudos. This is the only tree company that you need. I will provide references at any time. Great job, guys! Wonderful service and great technicians! Our new Lennox furnace was installed by L&S in 2009 and stopped working in 2014. Called them and a technician came the next day to inspect and two days later they replaced the circuit board. It worked fine till two days ago when it stopped igniting. So Mack came early yesterday, cleaned it and found that the problem might be with either the circuit board or the igniter (igniter failure error code). It worked fine for more than 12 hours but it was not starting during the night. I reset it several times during the night and early morning but the furnace kept giving the same error code. Called the office and less than 2 hours later Ken showed up with a new circuit board. He replaced it immediately, tested the system and now it work as expected. Fortunately I kept a copy of the extended warranty provided by Lennox for the furnace and had to pay only the installation fee, which is normal. Hope I don't have to see L&S technicians until next year for a yearly maintenance/clean-up of the unit. Very professional staff. Thank you Ken, Mack and all the others from L&S for the prompt service! Our service technicians always have prompt and effective solutions! You are a valued customer and we are very happy to hear everything went well. That's great that you were covered under the warranty program. That's always the best investment for your equipment. Thanks Ken and Mack for your prompt service!! Best plumbing service you'll ever find! Thank you Emil for taking the time to post this review. Every review counts for us, every customer counts and we are trying our best. Thanks again, John Dima. I needed an HRV for my house due to having an air-tight environment (thus had some stale air and lot of condensation). Called Renato and he came fast with a very good quote for my needs. 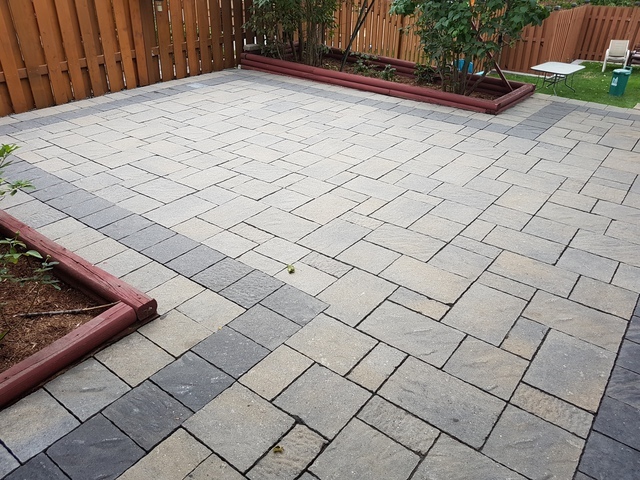 I chose him over other contractors since he was very knowledgeable and was able to answer all my questions with professionalism. The work was done very well and the results are amazing. 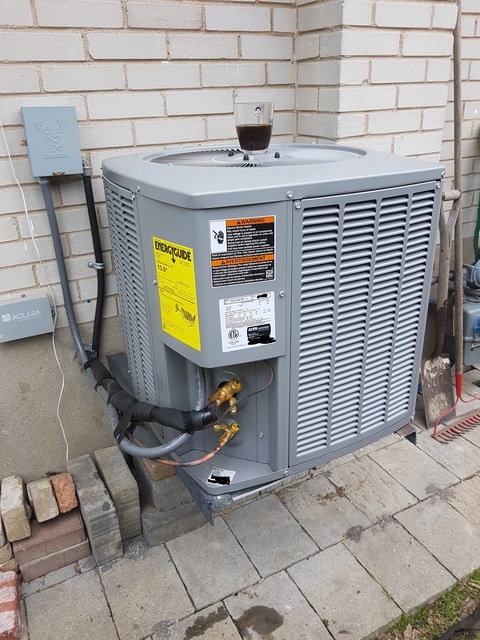 His crew was very good and they installed the unit as per my requirements, since my furnace room is a little small and wanted to maintain accessibility to the unit. I was also given the choice between several options and I’ve chosen a unit that is newer but more expensive and I don’t regret it. The work was done in a timely manner, a very good clean-up and uncluttered. Renato also did the balancing of the unit so same amount of air should go in and come out. Renato also sealed properly the ductwork that previous contractors didn’t do and I have to thank him for that, too. In short word, this was a very pleasant collaboration and Renato’s work is really professional. I have to admit that this company is the best contractor I've ever hired. The job was impeccable, fast and the results are ,amazing. I cannot thank Bill enough for the work he has done. Lots and lots of years of experience pay off as I have never seen so much dedication to his work. Let me say again that this team is amazing... from start to finish they were very professional and very knowledgeable. Job was done as described in the quote. Best quote I've had. Right on time, no problems.. I would highly recommend this company. Clean work, paying attention to details and always asking me if this is like I want/need it... even proposing much better alternatives! Thank you Bill! it was wonderful doing business with you! Laird and Son was outstanding in the quality of work. Their product line offered me the opportunity to choose what I need for my family and their recommendation was right on the spot. Reliable, knowledgeable and quick installation as quoted. best and most reliable service I've had in years... can't thank you guys enough for this... my house is outstanding now!!! Job was impeccable, as quoted, fast and reliable. This is going to last for years! Thank you, guys! Tony & Nick are very professional start to finish. Job was done as described in the quote. One of the best quotes. Right on time, no problems.. I would highly recommend this company. Clean work, paying attention to details and always asking me if this is like I want/need it... even proposing much better alternatives! Very professional and very knowledgeable. Thank you Tony, Nick, Darren, and Angela! it was wonderful doing business with you! We appreciate your business and glad that you feel confident in hiring us for your project. Doing 3 of your close neighbors was great as well! !